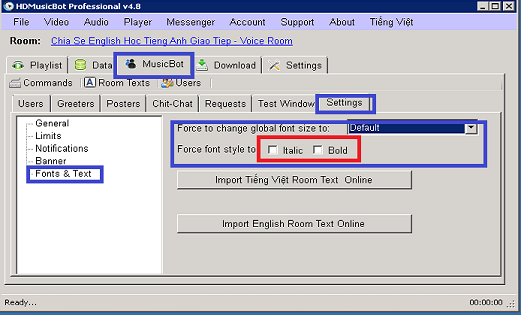 Remove / Ignore $ext which caused text was not sent to room option. 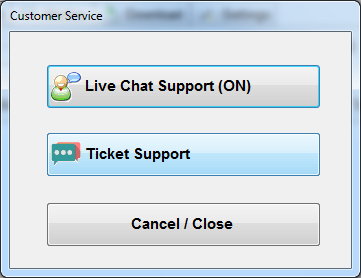 Test Window => Username is not saved. 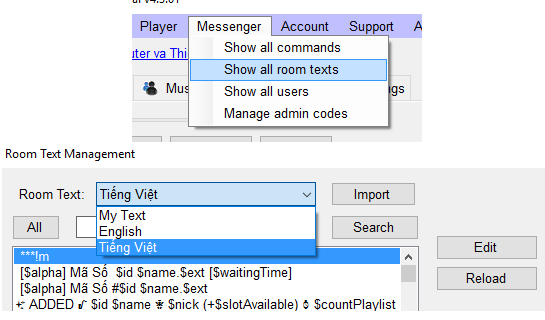 Room's name with dashes "-"
hd_slot_available (alias: !slot) - Check to see how many slot available left ($slotAvailable) . hd_playlist_top [index] - Move the media to the top by index. Example: If you have 5 medias in the playlist and you want to move 3 4 to the top you will type: hd_playlist_top 3 4. Remember it's the index not the media's id. hd_playlist_top_last - Move the last media in the playlist to the top. hd_playlist_top_random (!random, !lucky) - Randomly picks a media from playlist then move it to top (something fun / lucky person). Display(Req by: username) in the playlist list box. Download path did not store in the database. hd_download_to_pc - Online download to PC. Download Tab, you can click on "Find Song" and search for a song that you would like to download. It supports multiple downloads ... as long as you adds your song to the song to the download list. $alpha text support for "\$alpha/ $id - $name". You can color it. $ext - add the extension to the song list. "\$alpha/ $id - $name $ext"
poster - save checkbox for poster enabled. 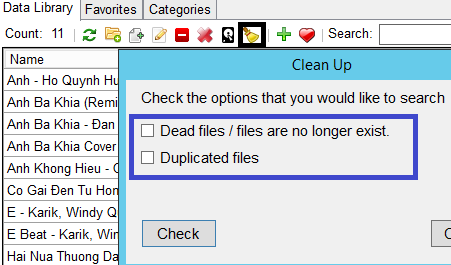 Checkbox ON / OFF to send off command message to room when command is disabled. Custom language text, when the command is disabled. command? - show the commands information: ROOT, SUB COMMANDS, and access user level information. E.G: add? • Enable short playing message when there is no comment. • Remember last scanned folder. • Huy's Mp3 ... up to 100,000 songs online. • BonPhuong.com's server ... up to 3500 songs. Crashed bugs have been fixed. • Greeter on disconnect / exit then re-join room. [Play Favorite] message when there is a media in the playlist. Bot Crashed when there is no text in room. hd_play_favorite_delete => Remove yourself from the play favorite list. hd_look_favorite_user => Looks at user's favorites. Auto Skip when user is not in room. Target's nick for copy favorites. change "move top and play" => "move top"
Load playlist on application start ups. v1.0 - 2013-02-24 First offical version released to public. • Duration for KMV file. • Web cam on on twice. * Click on the volume image turn on / off mute. * Help commands provide all available commands. Import and Export: Language and Commands. 100,000 songs added to the database. Fast loading and temporary cache data. Message display is not correct. Search feature for online version updated. Add song to playlist from online's server. Export folder -> txt file. Song ended go to next song. v0.01 - 2012-08-16 First release for testing feedback.